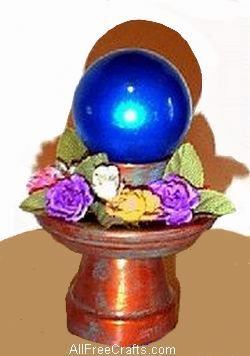 How to make a gazing ball from a glass Christmas ball ornament plus terra cotta pots and a saucer. This craft project would make a lovely centerpiece on a picnic table, so it’s a perfect homemade gift for a gardener or someone who likes sitting outside during the summer. Maybe that is you? Or someone else you know? Whoever you decide to make this craft for, they are sure to be delighted with their homemade gazing ball. This is a miniature gazing ball, as you can tell by the size of the pots and ball. 1. Paint all surfaces of the pots and saucer bronze or copper metallic paint, set aside to dry. 2. Take the top off the Christmas ball and paint the ball with the shimmer blue ice. Since Perm enamel is an enamel paint, I’m sure you could use most enamel craft paint glosses. Set aside to dry. 3. Dip a damp rag in the patina paint and rub on the terra cotta pots. Rub until most of the patina color paint comes back off, but leave enough to dull some of the metallic paint, creating a weathered look. Let dry and spray a sealer on. 4. If you used perm enamel on the ball, now paint on the perm enamel clear gloss gaze. If you used gloss paints, cover them with a high gloss sealer. Let the ball dry. 5. Assemble the pots and glue together with two-part epoxy glue or a strong, waterproof adhesive meant for outdoors. Put the 2½ pot upside down, center the saucer on top, upright, then glue the 1½ pot on the center of the saucer. Lastly, glue the gazing ball on top of the 1½ inch pot. 6. When everything is totally dry, glue the flowers around the 1½ inch pot and saucer. Enjoy!